Mennonite Volunteers Build Wooden Bridges Over Troubled Water in W.Va.
Chuck and Carol Adkins stand on the wooden decking of the bridge Mennonites designed and built for them in the wake of July 2015 flooding. The floods that ravaged West Virginia in June wiped out hundreds of private bridges - bridges that provide direct access to homes. And over 300 bridges were wiped out from flooding last year, too. It usually falls to residents to rebuild. 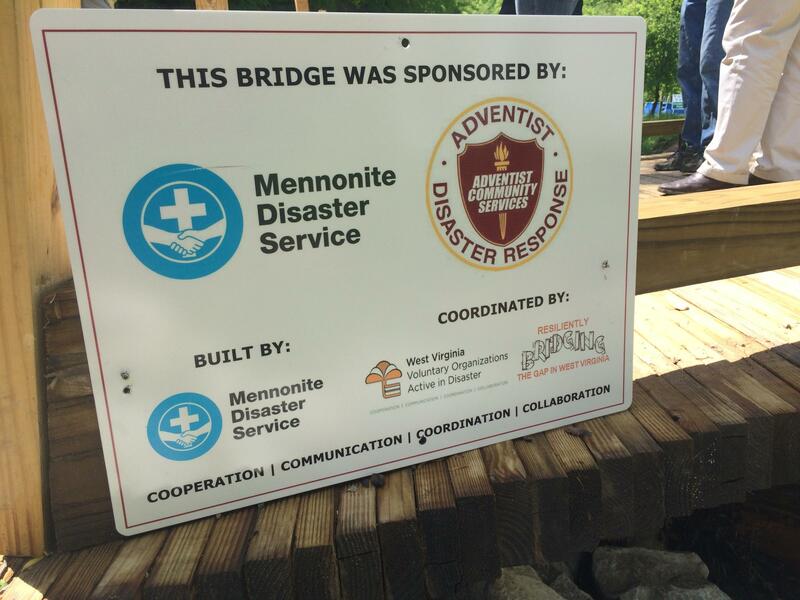 West Virginia’s Volunteer Organizations Active in Disaster (WV VOAD) called on Mennonites to help by building wooden bridges designed to handle flooding. 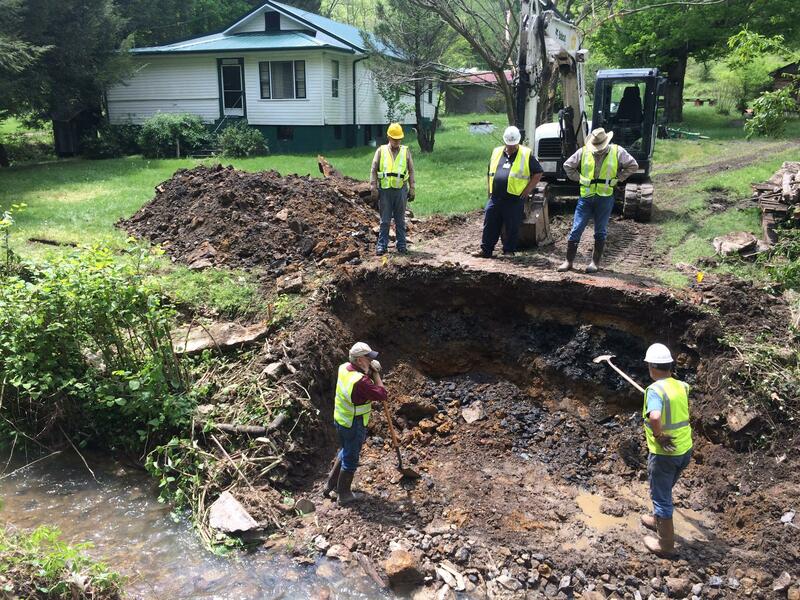 When hundreds of private bridges in the state were washed away by flooding last year, state chair of WV VOAD Jenny Gannaway set out to rebuild safer, stronger ones at no cost to residents — even though many people said that it would be impossible. Jenny Gannaway with a host of collaborators and invested parties celebrate the completion of the Adkins' bridge. In remote and mountainous Lincoln County, Gannaway stands with residents, government and religious leaders. They’re on the wooden deck of a 50-foot long bridge that Mennonites from Virginia designed and built. It crosses a stream connecting a state road to the house of Chuck and Carol Adkins. It’s the 15th one they’ve completed. “We’ve lived here 36 years; had my bridge 35 years,” said Chuck Adkins, or Preacher Chuck, as he’s known. He walks slowly with a cane. It’s flooded several times around their home since last year. There were no disaster declarations, and that meant no government funding to help rebuild. Replacing this bridge is a twenty thousand dollar job - something the retired couple can’t afford. Today, Preacher Chuck stands next to a sign he asked the Mennonite volunteers to paint. In large, white letters it reads: Thank God. Preacher Chuck walks across his new bridge in Lincoln County. It's been tested by flooding several times already and remains intact. A few ridges over - probably less than a mile as the crow flies, but several twisting turning miles by truck, there’s a machine shop preparing steel pieces of the next bridge. “I do the machine work for the bridges… just whatever they need,” said Bill Frye, the machinist who lives and works here. Frye has piercing blue eyes, and a lifetime of cutting and welding metal has left him with leather hands and strong like an ox. For 40 years he’s been working here for the coal mines, but he said he hasn’t had a single job for two months. “This is all I’ve got right now,” Frye said referring to the occasional work he does for the bridge builders. Frye’s handiwork for the current bridge underway ends up on the other side of the county with a group of Baptists. Jack Cobb and other volunteers stand on either side of a stream that has cut a fifteen foot crevice between them. With so many damaged bridges in the state, other religious organizations like the American Baptist Men are now stepping up to help. Cobb and his Baptist crew are retired contracting and engineering professionals from West Virginia. Volunteer crew of American Baptist Men build a bridge in Lincoln County, West Virginia. Cobb’s crew used a bulldozer clears the remnants of two washed-out bridges next to the creek. Many of the bridges washed away were made of trailer frames and wooden planks, or other recycled materials. Better ones might be cemented culverts. Cobb said the bridges the Mennonites designed are altogether different. The Mennonite who designed the bridges, Johann Zimmerman, says cost, as well as a volunteer-friendly building process were important design factors. But the main challenge was how to make them resilient. Wooden-decked steel beams are cemented to bedrock on either side of the creek, spanning across streams so as not to catch debris or disturb ecology. The structures are quickly built, more easily maintained and more resilient than what they’re replacing. Flood waters like those that wrecked communities in June tested his design. All are still intact. But he says the most impressive feature of the new bridges is the collaboration between organizations to make each one a reality. 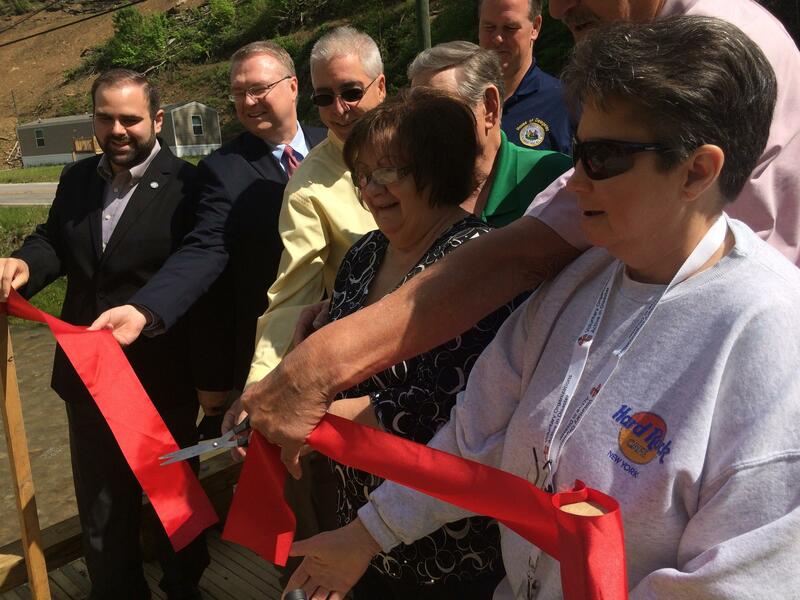 West Virginia Volunteer Organizations Active in Disaster designed this bridge project. It’s the first of its kind in the country, this year it won a national innovation award. The Mennonite Disaster Service was an early partner. Other participating organizations include the West Virginia Department of Highways, local fire departments, the state’s Department of Natural Resources, the state’s Department of Agriculture. Back on the bridge in Lincoln County Barbara Chalfant is a Presbyterian who is also participating in the project. Hundreds more bridges still need to be replaced costing thousands of volunteer hours and millions of dollars, but organizers in West Virginia like Jenny Gannaway remain undaunted. She printed the email she got a year ago suggesting the project is impossible. She says it’s still taped to her wall motivating her to press on. Two contentious pieces of legislation--one repealing the prevailing wage and the other making West Virginia a Right-to-Work state --see votes on the Senate and House floors, respectively. Both pass by slim majorities with some lawmakers even crossing party lines in the process. The prevailing wage repeal heads to Governor Tomblin's desk, but Right-to-Work will return to the Senate after some amendments in the House. Since Wednesday, a rockslide has covered a portion of Railroad Yard Road, blocking some residents in Iaeger from leaving their homes. According to Iaeger Mayor Joe Ford, local coal operator, Eddie Asbury, is on the scene of the rockslide and is in the process of removing the debris. McDowell County resident, Deedra Blevins, says she plans to climb boulders Saturday evening so she can bring supplies to her 70-year-old mother, Dorothy Frost, who is one of those trapped behind the slide.